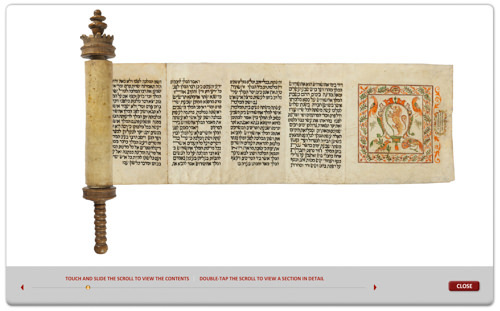 Occasionally it is possible to glean information regarding the provenance of decorated Hebrew manuscripts from the presence of a distinguishing family device. Family emblems were frequently depicted on the opening panel of Italian megillot produced during the seventeenth century. While the Jews of Italy were not granted formal coats of arms by the ruling authorities, Jewish families adopted heraldic devices and created their own insignias. Affluent Italian Jews used these informal family emblems on personal items as well as on Judaica they commissioned, such as marriage contracts, synagogue textiles, silver bookbindings, and Esther scrolls. 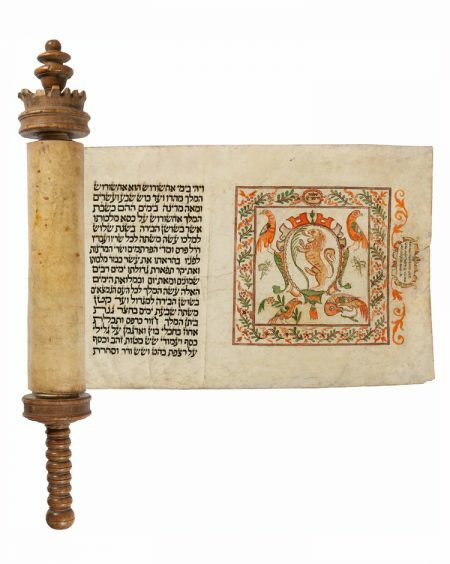 This otherwise undecorated Italian megillah is adorned with an elaborate ornamental opening panel featuring a heraldic device that depicts a rampant lion facing an elongated palm frond. The crest is surrounded by four birds and two winged insects set within a square foliate frame. The panel is painted in shades of orange, green, and yellow, a palette commonly employed in the decoration of Italian megillot in this period. A cartouche placed in the upper border of the open- ing panel contains the name Solomon Marinozzi, presumably the original owner of the scroll. A sec- ond, more elaborate cartouche to the right of the opening panel contains a later inscription. While the name of the purchaser is difficult to read, the inscription says: “This scroll belongs to Mordecai, son of Solomon Marinozzi of blessed memory, and it was bought by Solomon […] in the year 1652.” The large, square Sephardic script and generous dimensions of the parchment are characteristic features of seventeenth-century Italian scrolls; they demonstrate a desire to create a luxurious and eminently readable text. The scroll is mounted on a large seventeenth-century wooden roller of a type that was often employed for Italian megillot from this period. The handle is composed of convex bands, while the upper section features a turned and carved wooden crown topped by a knob. Roth 1967, pp. 165–184; Sotheby’s New York 1999, lot 53.